The last time the Cardinals beat the Patriots was 1991, and “Marky Mark and the Funky Bunch” were at the top of the charts. The Cardinals may be partying to that song Sunday night as they fly home, as they celebrate a huge 20-18 upset of the Patriots to improve to 2-0 on the young season. Kevin Kolb, starting for the injured John Skelton, threw for a score, and also ran for one as the Cardinals built a 20-9 lead and then held on with the help of a missed field goal at the end. Pats kicker Stephen Gostkowski trotted out to try a 42-yard field goal, but pushed it wide left to give the Cards the win. 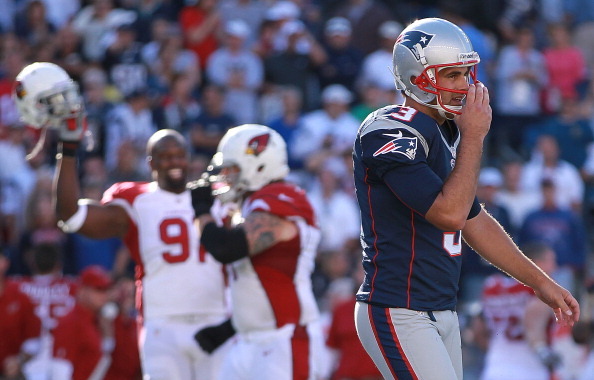 The Patriots got the ball back late when Vince Wilfork recovered a fumble at the Cardinals 30-yard line with 1:01 left.